Kieren Fallon has spoken about how he would like Frankel to take part in the Breeder’s Cup at Santa Anita later this year. There has been plenty of speculation about what the famous horse will do after 13 races unbeaten and Fallon certainly has his own opinion. Let’s back track for a little bit first and discuss the fabulous year Frankel has had so far. The Sir Henry Cecil trained horse has had a fantastic career to date, but the last few months have been extra special. First, there was the breathtaking performance at Royal Ascot to win the Queen Anne Stakes. 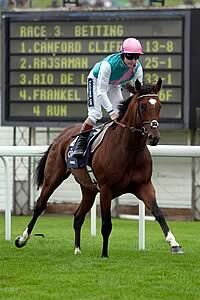 It was like nothing anyone has ever seen before as Frankel was hailed as the greatest horse in the history of racing. It was perfection. This was followed up by two more high-profile victories and these did nothing to undo the reputation of this wonderful horse. The Sussex Stakes and Juddmonte International wins simply left people wondering – what next for Frankel? Well, as mentioned, Fallon wants the destination to be America for what would be an eagerly anticipated swansong, something horse racing news sources are discussing at length. With reference to this, there have of course been plenty of people ready to suggest places for Frankel to compete. Everybody wants him to try something different, with the Qipco Champion Stakes and even the Prix de l’Arc de Triomphe mentioned as possibilities. How realistic is this though? Well, back in April, trainer Cecil did discuss the possibility of the Breeders Cup, saying that ‘time will tell’ with regards to this being the path Frankel will take. One thing for sure is that wherever Frankel goes, the world of horse racing will be watching. This is the greatest horse ever and if the 14th race is to be the last of a glittering career, we are sure it will be a memorable occasion and one that could impact the latest Horse racing betting odds from Bet Victor.